Today is the winter solstice, so from tomorrow the days start to get longer, thankfully, and although winter is far from over, we can start to think of spring. Today is also a day when I wanted to play. The lovely Elaine from Papercraft Button made some beautiful thank you cards recently and they reminded me that I had not used the Flower Patch stamp set from Stampin’ Up! yet. Off to the craft desk I went, and once I had dug said desk out from under the fragments of card I had been using to make Christmas cards I set to work. I had no idea what I wanted to do, or any vision of what sort of card I wanted to make so it was very much one of those working it out as you go along sort of cards. I started by stamping in a random fashion with one of the larger stamps from the set in Smokey Slate, then using a couple of the smaller stamps I stamped, again randomly, with Wisteria Wonder, Old Olive, Primrose Petals, Pool Party and Tangerine Tango. I matted this piece of card on Old Olive card which I popped on to my base card made of Whisper White. Then, I sat looking at it wondering what to do next! Inspiration finally hit me and I did the same again, but with smaller pieces of card. 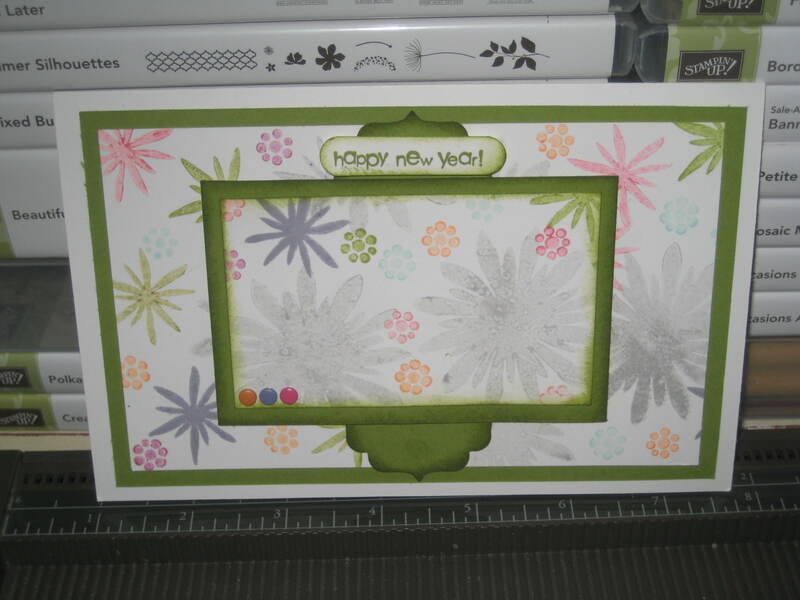 I then punched a shape using the Curly Label Bracket punch and cut it in half, tucked it under the smaller matter cards and finished with candy dots and the sentiment. Ta dah! A card all ready for spring. If you want any of the kit I used to make this card, just click the “Shop Now” button and off you go!